There are at least half a million more people in Utah today than a decade ago, and the majority are concentrated along the Wasatch Front. So a lot has changed over time, including trail use. The Foothills Natural Area extends from the upper edge of the Capitol Hill, Avenues and University of Utah neighborhoods to the boundaries of wildlife research and drinking water protection areas in City Creek and Red Butte Creek. The areas’ trail system is under review, as part of its ten year update. Lewis Kogan, manager of the open lands program for Salt Lake City, hopes that the general public will weigh in at a website specific to the plan. Results from a preliminary survey of about 1,500 Salt Lake City trail users showed three-quarters of them said they want to see more trail miles in the foothills, and over 90 percent want to see sustainable trails for current users and for demands of population growth. Another exploratory analysis of residents around the valley found more than half of the respondents use the targeted trails system at least once a month. Kogan says trails consistently floated to the top in answers about quality of life and access among those who represent all demographics and all parts of the city. With that heavy use comes conflicts, especially along the Bonneville Shoreline Trail. Kogan says resolving those is a major goal because of growing numbers of mountain bikers, hikers and those enjoying preserved open space. “More and more people are seeing conflicts between dogs and bicycles, with trail crowding, conflicts with people who would like to learn how to use a trial and are new users or are less fit and struggle to find a trial that works for them,” he says. Kogan notes that some of the trails are simply too steep. Among the ideas being floated is re-routing some for better use and less erosion. As well, leaders are proposing single-directional trails for bicyclists, an idea that’s getting mixed reviews. 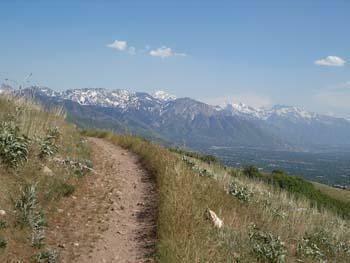 Kogan points to the Wasatch Crest Trail as a destination that can be problematic. He says when hikers have to step off the trail every few minutes to allow bikes to pass, they quickly appreciate how single-directional trails can be beneficial. On the topic, the responses of the two statistical surveys are split. With crowds come parking challenges, too. That issue is being addressed in the questionnaire, and with long-term planning. Kogan says they hope to site trail heads for easy access for public transit users. He says those would have substantial parking and potentially have bathrooms and drinking fountains in the future. Who’s paying for it? That depends on what trail segment is in play and whether it’s a new trail build or regular maintenance of existing trails. Kogan says his office is looking at endowments and cost-share programs among agencies, and exploring long-term funding to keep the trail system in top shape. The public comment survey will be live until early January.